Ampthill outscored Cinderford by seven tries to two as they stormed to a 47-14 victory at Dillingham Park. Amps, with three consecutive away games coming up, were determined to take advantage at home and produced their best opening quarter of the season – scoring four tries in 20 minutes. First, centre Elliott Reeder slipped his cover inside the Cinderford 22 on six minutes to touch down after the home side had patiently moved the ball through multiple phases. Full-back James Pritchard added the extras. Straight from the kick-off, Ampthill were back on the attack and the visitors had no answer when left wing George Elliot took a short ball in midfield outside their 22 and stepped his way to the line past three defenders for a fine individual try in the ninth minute. Pritchard added the extras from an almost identical position as his first. The third try followed on 16 minutes as the ball was moved through the hands to Pritchard, who drew the last man and fed wing Jonathan Morgan for an unconverted try wide on the right. With the kick-off again secured, Amps were delighting the crowd with their offloading skills, and Maama Molitika touched down to secure the bonus point, with Pritchard converting. At 26-0 after the first quarter, Cinderford would have been forgiven had their heads dropped, but a speculative pass from the home side on halfway was intercepted by centre Samuel Hanks who raced under the posts for a 29th minute try converted by Sheedy. The second half began as the first finished, with Cinderford seeing plenty of the ball, but a 54th minute catch & drive from the hosts resulted in a converted score for flanker Matthew Burke. It was a special moment for Burke, who was making his 137th appearance for Ampthill in the national leagues and becoming Amps’ most capped national league player in the process. Just two minutes later, the visitors responded in similar fashion with a well constructed maul, securing a converted try for replacement Thomas Bozzard. The last quarter saw the visitors throw caution to the wind and run the ball from everywhere, producing some entertaining open field breaks and forcing the hosts to defend. 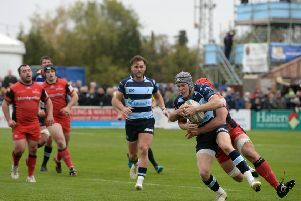 But it was Amps who scored two further tries through blindside flanker Darrel Dyer and fly-half Joseph Tarrant, with Pritchard converting the former and Elliot the latter.